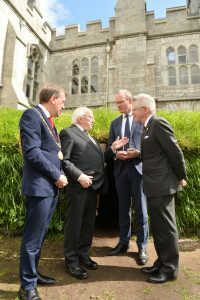 President Michael D. Higgins is today (Saturday 12 May) officiating at the National Famine Commemoration at University College Cork. He will be accompanied by An Tánaiste Simon Coveney T.D., representing the Government. 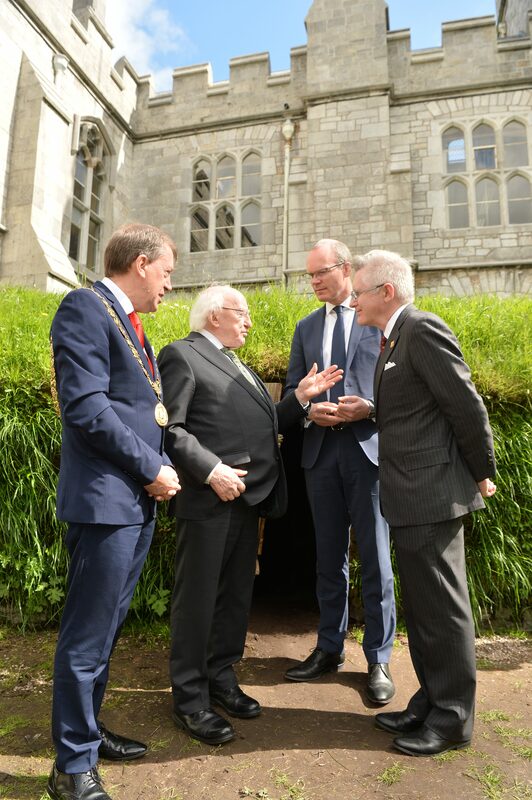 Following the ceremony, President Higgins will visit An Bothán, a replica of a 4th class dwelling (categorised in the census of 1841 as ‘a single room cabin built of organic material’), reflecting the horrible and all too common living conditions of the time. An Tánaiste Simon Coveney, will launch the Great Irish Famine Online in the Aula Maxima, UCC. This new digital resource is a major collaboration between the Geography Department in UCC and the Department of Culture, Heritage and the Gaeltacht and will be an invaluable source of public history for current and future generations. Detailed information charting changes in the social, political and economic landscape of pre and post Famine Ireland will be made available to users all over the world for the first time, through the App or by viewing the material online. Today’s formal State ceremony will include military honours and a wreath laying ceremony by Ambassadors to Ireland in remembrance of all those who suffered or perished during the Famine, as well as readings, poetry and music, featuring two musical compositions by Seán Doherty, both of which – Professor Boole’s Farewell and Fr McCarthy’s Lament, 1847 – were commissioned specially for the occasion by UCC. These works will be performed by the Vanbrugh with Niall Vallely, and guests. There will also be performances by Karan Casey and Iarla Ó Lionáird who will sing with a massed Choir composed of the Cork Penny Dinners/ High Hopes Choir, Crosshaven Community Choir and UCC Choral Society. In his speech, President Higgins will reflect on the economic and political factors that contributed to the Famine, the impact that it had on Irish society and the Irish language, and the importance of scholarship and the arts in preserving the memory of what was the greatest catastrophe in Irish history. The Minister for Culture, Heritage and the Gaeltacht Josepha Madigan T.D., speaking in advance of the Commemoration, paid tribute to UCC noting that “The commissioning by UCC of music composed by Seán Doherty will form part of the legacy of today’s events and is but another example of the College’s longstanding commitment to commemoration of the Famine”. I am grateful to everyone who participated in today’s commemoration. As a community of scholars, UCC continues to ensure that those who suffered during this catastrophe are appropriately remembered. I would also like to acknowledge our partners in the community whose enthusiasm and creativity has enriched the programme of activities organised to coincide with today’s Commemoration.